Together with Royal Historic Palaces, the Sebastian Cox studio and workshop have designed and made a series of automata cabinets and benches for the recently refurbished Great Pagoda at Kew Gardens. In the ground floor of the Great Pagoda you will find a pair of automata, created by Fi Henshall, telling a tale of the pagoda’s history. Her extraordinary mechanical creations are created entirely by hand from beautiful but obsolete found materials and objects. Ascending the pagoda you will pass our collection of benches, offering a place to sit on every other floor. 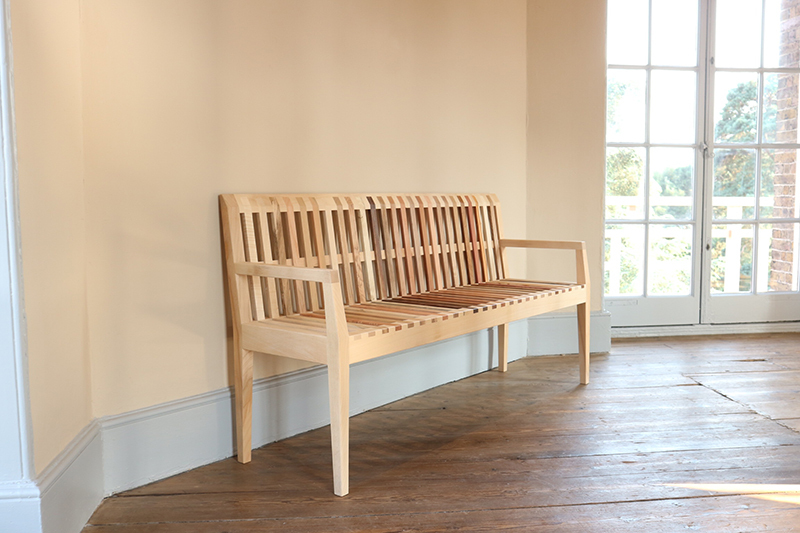 Each bench comprises a library of 26 useful, unusual and treasured tree species which once grew in Kew Gardens. Each species name is engraved in latin on the corresponding component. We are delighted to have been involved in the restoration of this magnificent 10 storey 18th Century building alongside so many talented craftspeople. It is open to the public now, until September 30th. Read more about the Great Pagoda here. Play your visit here.